Shanghai: World champion Kento Momota revved into the last four of badminton's $1.5 million World Tour Finals with a third comprehensive victory on Friday. The all-action Japanese star powered past Indonesia's Tommy Sugiarto 21-14, 21-8 in just 36 minutes in the Chinese city of Guangzhou. Joining the world number one from Group B is the late Indian qualifier Sameer Verma, who will play home hope Shi Yuqi in Saturday's last four. 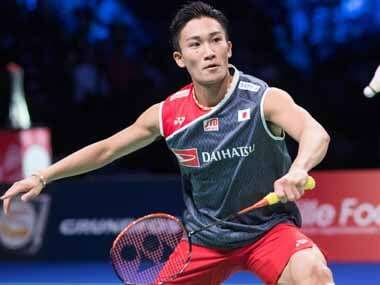 Momota, the man to beat, will be a strong favourite against South Korea's Son Wan-ho in their semi-final. The 24-year-old Momota has won all three of his matches this week without dropping a game. Victory in Guangzhou would be a fitting end to a spectacular year in which he has reached number one in the world for the first time and won his maiden world title. It is all a far cry from 201, when he was banned for more than a year by the Japanese team for visiting an illegal casino, missing the Rio Olympics. In the women's draw, there was heartbreak for world number one Tai Tzu Ying. The Taiwanese retired with a right hamstring strain against Japan's Akane Yamaguchi and said, "I’ve never had this injury before." "I felt it during today’s match. I feel bad that the tournament ended like this for me, but there was nothing I could do," she added. Yamaguchi will face Nozomi Okuhara in an all-Japanese showdown while in-form P.V. Sindhu of India plays Thailand's Ratchanok Intanon in the other women's semi-final.